Edmond Hoyle, Gent. : Were there Cogan collections of Hoyle? Were there Cogan collections of Hoyle? Previously, we have looked at collections of Hoyle issued by Osborne and the Ewings in publisher's bindings. That these are separate issues is evidenced by contemporary newspaper advertisements and, in some Ewing copies, a collected title page. The collateral evidence is supported by clues in the books themselves. There are a handful of books that contain multiple Cogan editions bound together: three at the Bodleian Library, one at the Lilly Library at Indiana University, plus one or two others. Might any of these have been issued by Cogan in a publisher's binding? There are no newspaper advertisements suggesting that Cogan issued Hoyle as a collection, nor is there a collected title page in any of the surviving copies. We are left only with the evidence of the books themselves—and some information about how they came to be acquired. Hoyle (E.) A Short Treatise of the Game of Quadrille, 1744; A Short Treatise of the Game of Piquet, 1744, FIRST EDITIONS, signed by the author; A Short Treatise on the Game of Back-Gammon, FIRST EDITION, 1743, a few headlines shaved, old calf in 1 vol. The description omits Whist.5 and Memory, which, as we shall see, must also have been present. Containing Quadrille first edition, whist fifth edition (The only other copy known to be in existence is in the British Museum), An Artificial memory, first edition (the only copy recorded.) [All to be catalogued separately.] (duplicate) copies of Piquet and Backgammon, both first edition." The stricken text is Jessel's and echoes what happened to the book—he did something quite tragic and out of character. Jessel removed the first three treatises from the volume and had them bound individually in library bindings. Apparently when he acquired this book, he did not yet have these three treatises and wished to have them in separate bindings. Quadrille is now shelf mark Jessel f.583, Whist.5 Jessel f.542, and Memory Jessel f.586. Piquet and Backgammon, which he already owned, remain in the original binding, with the front board and the much of the spine flapping free where the other treatises had been. What a shame! Of these books, Whist is not autographed and the autograph from Quadrille does not look like Hoyle's signature. Compare the signature from Jessel f.583 (reproduced from ECCO) at left with a more typical signature at right. Of course his "separate copy" of Whist.5 and other copy of Memory were those he removed from the first book, a book which is as likely to have been issued by Cogan as this book. One wonders whether, in writing this note, Jessel regretted what he had done to the other volume. It seems probable that all three volumes were, as Jessel suggests about one of them, "issued bound together by F. Cogan." The binding of all three books is similar: boards decorated with a double fillet, six spine compartments with a label in the second (except for F.580 which had been rebacked). They would have been issued sometime after October 1744 when the last of the books, Quadrille, was published. There is another candidate at the Lilly Library, shelf mark GV 1277 .h89 1743. It consists of Whist.4, Memory, Backgammon, and Piquet, all in a contemporary calf binding resembling the three from the Bodleian. Curiously, none of the treatises is autographed by Hoyle. These four books make me wonder about a book in my collection. I have a copy of Whist.4 bound with Memory and Backgammon, all treatises signed. 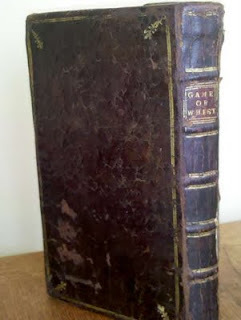 It is a contemporary binding quite similar to those discussed above (see picture at left). All have six panels on the spine, a label, and similar tooling. Could this be a Cogan collection as well? If so, it likely predates the January 1744 publication of Piquet. There is one other candidate that may be even earlier. The Harry Ransom Center at the University of Texas has Whist.4 bound with Backgammon, shelf mark GV 1277 H98 1743c GTE. Both treatises are autographed by Hoyle. Interestingly, the book has a fore-edge painting showing playing cards, which may be the reason that the binding is not original. I don't think we'll ever know whether the treatises were originally sold in a Cogan publisher's binding, perhaps earlier in 1743 when only Whist.4 and Backgammon were available, or bound together later. The similarity of the contemporary bindings convinces me that the at least five Cogan collections of Hoyle survive. With the evidence about the Harry Ransom copy equivocal, I like to think of mine as the earliest collection of Hoyle. 1Col. Barzillai Lowsley was a minor author and serious collector of gaming books and books related to Berkshire, England. He wrote Whist of the Future, London: Sonnenschein (1898). My copy, presented by the author to Lord Sherborne, is pictured above.